WHEELING — It all comes down to this. Swimmers from all over West Virginia will compete for the state championship beginning Thursday into Friday at the West Virginia University Natatorium. Wheeling Park, Wheeling Central, John Marshall and Brooke are all well represented with the Patriots taking 17 swimmers, the Knights taking eight, the Bruins’ 10 and the Monarchs’ eight. Leading the Park boys is Caleb Lucas, who turned in the fastest regional time of all swimmers in the state in the 100 freestyle at 49.20. Last year, he set the school record at the state meet with a 49.9, earning him third. Lucas will also be competing in the 200, 200 relay and the 400 relay. Hoping to earn a second straight state title is senior Charles Schellhase, who was crowned champion a year ago in the 500 with a 5:01.51 time. This time around, he is competing against University freshman Frank McCutchan, who won the regional race by less than a second over Schellhase. As Schellhase looks to go back-to-back and defeat McCutchan, he will also be focused on the 200, 200 relay and the 400 relay. 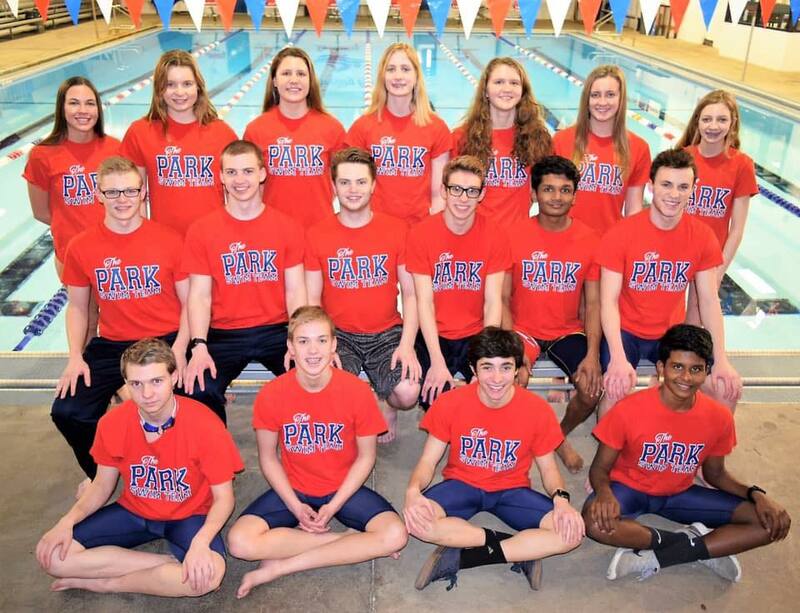 Other Patriots boys in individual events include Manaved Kuttan in the 50 and 100, Alexander Dague in the 100 breaststroke, Cole Franko in the 200 and 100 butterfly, Max Kellas in the 100 butterfly and 200 IM, Devanand Kuttan in the 200 IM and the 100 backstroke, Isaac McCabe in the 100 breaststroke and Garrett Rogerson in the 200 and 500. Park assistant coach Amy Hensler added: “I keep reminiscing. This senior class of both boys and girls has to be the most decorated teams in our building. Durkin’s boys’ squad has three relay teams, as well, in the 200, 400 and medley relays. Schellhase, Lucas, Manaved Kuttan and Dague will race the 400 relay and Nick DeFazio will take over for Kuttan in the 200 relay. The medley relay team includes Max Kellas, DeFazio, Devanand Kuttan and Dague. Other local boys from Wheeling Central include Kelly Riedel in the 100 breaststroke and 500, Cole Saseen in the 100 backstroke and Nate Nixon in the 500. John Marshall’s Creed Kidney, who finished seventh in the 200 at state last year, will look to medal in the 100 this season. Ethan Pond and Cullen Wise will take part in relay events for the Monarchs. For Brooke, it’s John Francis (100 butterfly and 100 breaststroke), Ethan Robey (100 breaststroke and 500) and Anthony Taylor (100 and 50) who will lead the boys. Jacob Donley and Brandyn Rouse will take part in relay races for Brooke. In girls action, Park’s Jenna Bopp and Abby Turner each turned in the fastest times in the state at regionals in the 100 breaststroke (1:08.22) and 100 (54.63), respectively. Both of their times at regionals were faster than their times at state last year, in which Bopp earned runner-up honors and Turner placed fourth. Bopp is also set to star in the 200 IM and medley and 200 relays. Turner will join her in both relays and will also compete in the 50. Senior Sarah Heilman is also hoping to cap off her outstanding career as she competes in the 200 medley relay, 200 relay, 200 and 100 backstroke. Joining the trio in both relays will be Melina McCabe, who will also take part in the 200 and 400 relay. Alongside McCabe in the 400 relay is Maggie Kloss, Emma Delk and Barbara Blicher. Delk is a 200 competitor and Blicher is in the 100 and 100 breaststroke. Lauren Garan earned automatic bids in the 100 and 50 for Wheeling Central. She will be joined by teammates Patricia Tiu in the 500 and 200 and Madie Riedel in the 100 backstroke. Central’s relay teams will see Brooke Lander and Abby Gerney. The JM girls are led by Laura Siler who hits the water in the 50 and the 100. Zara Zervos is also back to state for her second straight year in the 200 IM and the 100 breaststroke. Morgan Miller is making the trip in the 500 and Avery Knutsen and Katie Cochran are relay members. Brooke’s Emily Donley (100 butterfly and 100 backstroke), Mary Ossman (500, 200) and Veronica Mann (500, 50) round out the local individuals, while Shelby Ferrell and Hailey Beadle are relay finalists.